It’s a new year, and it’s time to start the story of a new line in my family. As I was finishing the history of the Katzenstein family, I pondered which line I should work on next. Growing up, I’d only known the surnames of some of my ancestors: Cohen, Seligmann, Nusbaum, Schoenthal, Katzenstein, Brotman, and Goldschlager, the lines I’ve focused on so far. I did not ever hear the names Jacobs, Schoenfeld, Hamberg, Goldschmidt, Brod, or Rosenzweig. Those names had disappeared when the women took their husbands’ names and gave their children only their husbands’ names. But after researching the husband’s lines, I learned the birth surnames of their wives. So now it’s time to go back and find the stories of these other families. I have decided to start with the Goldschmidt line—the family of my great-great-grandmother Eva Goldschmidt who married Gerson Katzenstein. She was the mother of my great-grandmother Hilda Katzenstein Schoenthal and the grandmother and namesake of my grandmother Eva Schoenthal Cohen. It made sense to start with the Goldschmidts because they are entangled in several ways with both my Katzenstein relatives and my Schoenthal relatives, as you will see. Also, I am intrigued by the idea of following the direct female line of my paternal grandmother–from Eva Schoenthal to Hilda Katzenstein to Eva Goldschmidt. Thanks to the incredible work of David Baron and Roger Cibella, I can trace my Goldschmidt family back to my fifth-great-grandparents, Falcke Jacob, born in about 1697, and his wife Sara (surname unknown), born in about 1704. Years ago David and Roger put together a website that traced the history of the Goldschmidt family and Oberlistingen and included excerpts from Chapter III of Dieter Carl’s book, Die Juden Geschichte Beider Listingen [The Jewish History of the Two Listingens] (Herausgegeben vom Gemeindevorstand der Gemeinde Breuna, 1999), as translated by Joseph Voss. According to Dieter Carl, Jews had been expelled from the Hesse region by Duke Phillip the Generous in the mid-16th century in response to pressure from Martin Luther. Then in 1592 Lord Moritz allowed a few Jews to settle in the region. Eventually more Jews settled in the Hesse region, but restrictions were imposed. The unique position of the Jews derived from the nature of their religion, on one hand, and, on the other hand, stemmed from the nature of a people who had no citizens rights, who were not fully free, and stood outside of the established Christian society. Therefore the Jews had gained the special protection of the Feudal lords needed for their security and livelihood for economical activity and housing. Originally this protection was in the hands of the Kaiser, but in time it transmitted down to local Dukes. …. [T]he Dukes of Hessen … gave to certain families a letter “schutzbriefe” of protection–the legal basis for living in these rural areas. The receiver of the schutzbriefe had to pay a reasonable sum and had to provide other services for the Lord. The protection letter gave the Jews the legal right to trade and lend money. For a long time Jews could not become artisans, farmers or civil servants, but only moneylenders or traders. In order to limit the number of Jews in Hessian towns and villages, the letter could not be inheritable. In reality though, the letter was passed down from father to eldest son with a small sum paid in order to continue that right. This was beneficial for the right to do business and who could establish a family; hence the authorities could control the size of the Jewish population. All the Jews for whatever reason did not possess the Schutzbrief, the youngest sons and unmarried daughters were the so-called “Unvergleitete” or disinherited. From these large groups were created the Jewish under classes or “Unterschicht”. These consisted mainly as the “knechte, or the worker/ servants, the men and women who served the Schutzjuden in their employ. In part they lived in great poverty and some resorted to begging for their livelihood. I, the undersigned am writing because I am protected by the esteemed sires of Malsburg. I wish to become a member of the Oberlistingen community with permission to reside there. I have obtained all of the rights to function in this community as a Jew and who has officially received these rights along with your right to cancel my contract. Furthermore I am obligated, if the community is in need of money, and if I have the means to provide a loan without interest without damage to myself, I will make an advance to them if the need arises. All of what is said here and recorded is based on free will and opinion, which my signature authenticates. Who was Juden Falcke? Was he related to me? My fifth-great-grandparents Falcke Jacob and Sara had three children: Jacob Falcke, born in 1729; Joseph Falcke, born in 1734; and Blume Falcke, born in 1740. Following the March 31, 1808 decree requiring Jews in the region to adopt surnames, Jacob Falcke adopted the surname Goldschmidt. Carl concluded that the “Juden Falcke” who received the first Schutzbrief for Oberlistingen was Jacob Falcke Goldschmidt, my four times great-grandfather. His brother Joseph adopted the surname Neuwahl and eventually also received a Schutzbrief to live in Oberlistingen. Jacob Falcke Goldschmidt and Eva Reuben Seligmann had four sons: my three-times great-grandfather Seligmann and his brothers Lehman, Meyer, and Simon. Dieter Carl also listed an unnamed daughter, and David Baron found a reference to this daughter in the Alex Bernstein Collection at the Leo Baeck Institute. Her name was Jette, and she was born May 4, 1793; she married David Grunewald of Hoexter, Germany—the region that is the focus of Alex Bernstein’s research. According to his research, Jette died on August 4, 1822, and did not have any children. CORRECTION: David Baron pointed out that I had misread Bernstein’s research. He found that Jette Goldschmidt did have children with David Grunewald before her death. First, a son Jacob Grunewald was born May 5, 1820; a second child was stillborn on July 30, 1822. Jette died five days later, presumably from complications from childbirth. Jacob Grunewald married and had fourteen children. Later I will return to these Goldschmidt cousins and report on them more fully. Although I am primarily interested in my three-times great-grandfather Seligmann and his descendants, I will also write about his brothers, in part because his brother Simon was married to Fradchen Schoenthal, sister of Levi Schoenthal, my great-great-grandfather from Sielen. Yes, my family tree continues to twist and bend. 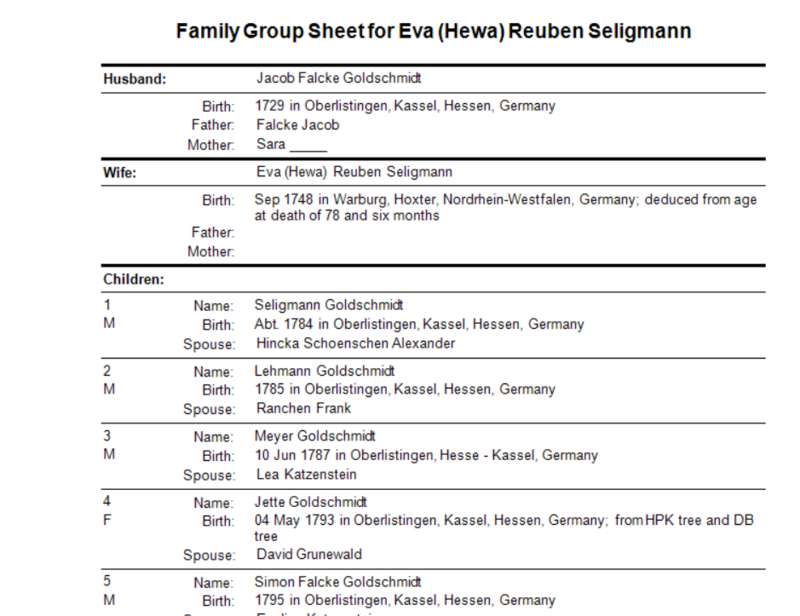 There is no known familial connection between Eva Reuben Seligmann, who was born in Warburg, Germany, and my Seligmann ancestors from Gau-Algesheim. This information all comes from Dieter Carl’s book as excerpted on the Cibella-Baron website. I will be focusing only on the children of my direct ancestor, Jacob Falcke Goldschmidt. This entry was posted in Genealogy, Goldschmidt/Goldsmith, Oberlistingen and tagged Antisemitism, Germany, Goldschmidt, Oberlistingen, Schutzbrief by Amy. Bookmark the permalink. I wondered if “Juden” in the signature Juden Falcke may mean Jewish instead of being the plural form of Jude>/i> or Jew. When I googled the two together I found Roger’s site. It indicates the signature was in Hebrew. I wonder if something may have been lost in translation. Sometimes the German language is so complicated. But the important thing is that the name Falcke was signed and as the population was limited according to the laws of the time, it would appear that he must have been your ancestor Jakob who later used the Goldschmidt surname. Thanks, Cathy. I also wondered why it was in plural form. Thanks for checking that! You’re welcome. I liked the historical detail – very interesting. Looks like I made a mess of my comment with one tiny typo. Sorry about that, Amy. I meant to place only Jude in italics. I ended the italics with >/i> instead of and the rest of the comment is in italics. The word Jude has a weak or N declination. That means it adds an N in all cases except nominative singular. I don’t know, why but conceivably this is the accusative singular, not the plural. Interesting! I still struggle with the various cases and the formation of plurals. All the variations are too much to keep in my brain for some reason, no matter how much I practice. Thanks, Ralph! Dear Amy, I am impressed with your clear and very readable approach to your ancestral roots. I also noticed a similarity in our family trees in the fact that there is a Jewish branch on my grandmother’s side. Your post motivates me to carry on with my own family research, once I am done with Book I of the Peter and Gertrud Klopp Story. I am looking forward to reading your next post, Amy! Thanks so much, Peter! If you need any tips on Jewish genealogy when you start researching, let me know. Thank you, Amy! I will remember your kind offer, when I need your help one day. Like you, I have a fantastic resource, a book written by a distant cousin. It is all in German, so I have the additional task of translating the text into English. And that’s how I started studying German—so I could read a cousin’s book. Do you know German? Good luck! German is my native tongue, Amy. Ah, of course—I’d forgotten. Lucky you! It must have been easier to learn as a child than it is for this 60+ year old! Let’s hear it for those maternal surnames! Looking forward to reading about your discoveries. We have a habit of using maternal surnames as middle names in our family, and I’ve always liked the custom in Panama of including the mother’s surname in a person’s full name (typically “given-name middle-name paternal-surname de maternal-surname”). In this way, the maternal surname doesn’t get erased. I also wish that we had the tradition they have in Spanish speaking countries of using the maternal surname as well as the paternal surname. So I “cursed” my daughters by giving them a hyphenated surname! I originally had a couple of paragraphs in this post bemoaning the disappearance of maternal surnames, but the post was getting too long so I edited them out. I hate the way that the Jewish population in German villages was seemingly controlled and restrained in that era. I agree with Cathy about the “Juden” signature referring to your ancestor Jacob Falcke/Goldschmidt. Thanks, Shirley. Yes, it was quite inhumane….but has society really learned much? We still place quotas on anyone we perceive as an outsider. Yep, it’s possible. But the Seligmann was not related to OUR Seligmanns—they were from a different part of Germany. But it sure doesn’t make my job any easier! I wish I had answers to your questions, but I need to do more research. I’ve seen many mentions of these schutzbriefs but no in-depth discussion of the details. I will have to ask around and see if someone can point me in the right direction. Thanks, Luanne. Every time we turn around there is a new element of history that has to be researched! It’s amazing how little there is online about schutzbriefe—nothing much more than what Dieter Carl explained in his book, as quoted above. I’ve ordered a book that might have more information. I will keep you posted. What an great introduction to this branch for the new year. I found it interesting that Jacob Falcke took on the last name of Goldschmidt and his brother Joseph chose a different last name – Neuwahl. I too simply read ‘Juden Falcke’ as Jewish Falcke or Falcke the Jew. Learned a new term – schutzbrief – your posts are always so informative and historical. I love the education I am getting. I need to do more research, but my understanding is that brothers often chose different surnames to disguise the fact that they were from the same family so that both could stay in the same location. I think it also is linked to the schutzbrief requirement. I will see what else I can learn. I have not communicated directly with him in several months, but he and I went through Oberlistingen when I was in Germany in 2017.